Want a ticket to paradise? Well, here it is! Our 27' Tropical Rush dual-lane water slide will have you feeling like you are on island time. This massive water slide features towering palm trees and a radical sliding 70 degree angle that's sure to get the adrenaline pumping as riders scream down the Tropical Rush. At the bottom, riders continue down 26' of additional sliding fun ending into a pool. 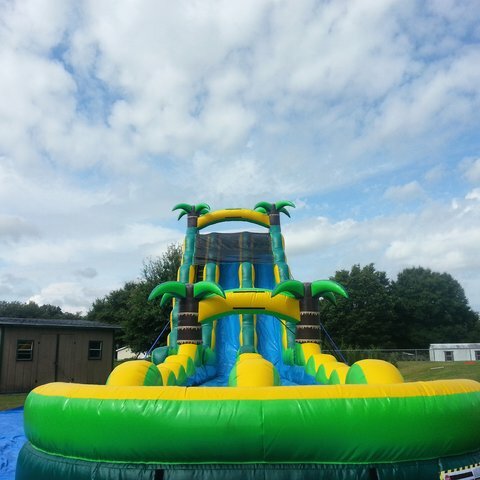 This combo water slide will blow your mind and leave you wanting more! The Tropical Rush is perfect for schools, churches, summer camps and more. Perfect for teenagers and adults, so reserve yours today!